Yearlong activities began on Sunday, January 29, 2012, with an array of pomp and ceremony befitting the rich heritage of the parish and its dedicated parishioners. The celebration ended on Sunday, December 2, 2012 with a weekend of activities which included a Day of Reflection titled, “We’ve Come This Far By Faith” and a Closing Mass Concelebrated by Bishop Robert Guglielmone who was the main Celebrant at the Opening Mass in January. Mass -10:00 a.m. - Bishop Robert Guglielmone was the Main Celebrant. A reception and program followed the Mass in Figaro Hall. The first Mass was held at St. Patrick on January 29, 1837. Mission (Revival) –Facilitated by Father Freddy Washington. He was ordained in his home parish, St. Patrick, on April 1, 1991. Mass and Reception – 6:00 p.m. - Cornerstone of the first Church building was laid on St. Patrick’s Day, March 17, 1838 and the cornerstone of the present Church building was laid on St. Patrick’s Day, March 17, 1886. We celebrated these historic milestones and our Patron Saint Patrick. Activities included a morning Mass celebrated by Bishop Robert Guglielmone. He was also the Main Celebrant at the Vigil Mass with Monsignior Chet Moczydlowski and our priest, Father Henry Kulah. We also sponsored a float in the annual Charleston St. Patrick's Day Parade. The Jazz Affair – This very successful anniversary fundraiser featured well-known Jazz Artist, Charlton Singleton and his Band. The multi-talented musician is also our parish Organist and Director of Music. 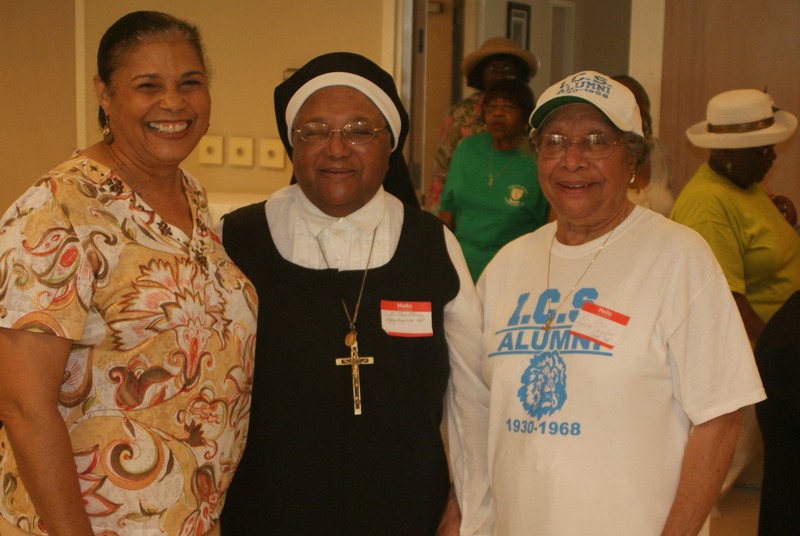 Homecoming Weekend – Celebrate the 1967 merger of St. Patrick and St. Peter’s Churches and a tribute to the Oblate Sisters of Providence who taught at Immaculate Conception School from 1917 to 1973. Anniversary Gala – A night of good music, dancing and fun! (8 pm-12 Midnight in Father Figaro Hall). Closing Celebration Mass (10:00 a.m.) – Main Celebrant, Bishop Robert Guglielmone. Concelebrants: Father William Headley, Father Phillip Howard (Former Priests at St. Patrick) and Father Henry Kulah. A reception followed the Mass in Father Figaro Hall. We learned and shared a lot about our history by way of a very informative and insightful display of archival photos, documents and other items.